Every now and then we hear from one of Xiaomi’s side projects and more often than not it’s something eye-catching and relevant. And so it is with the new Yeelight smart speaker from Yeelight, a Xiaomi subsidiary that dabbles in home automation products. The Yeelight speakers have great hardware chops, but it’s a spitting image of Amazon’s Echo Dot. It even has the blue LED that’s an Alexa trademark, along with similar hardware buttons on top. And Yeelight also shares some software genes with the Echo Dot, as it comes with Alexa voice assistant support. 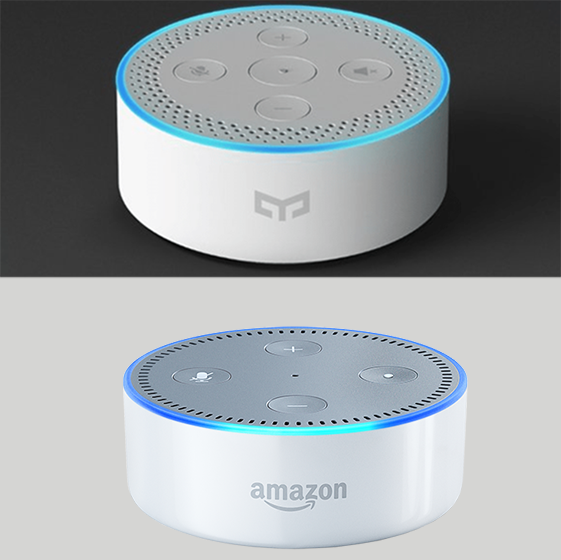 But this is Xiaomi after all and to set it apart from Echo Dot, you also get Microsoft’s Cortana inside. The Dual AI is a real USP for Yeelight. It comes with a 2-watt speaker, a six-microphone array to pick up users’ voice commands. The company claims that you can wake the speaker up from up to a 5-meter distance and there’s also an advanced acoustic echo cancellation (AEC) for improved clarity and beamforming technology for echo reduction on board. The whole thing is powered by a quad-core Cortex A53 processor with 256MB of RAM and an equal amount of internal storage space. Connectivity options include dual-band Wi-Fi and Bluetooth Low Energy (LE). Just like any other smart speaker out there, Yeelight can take care of basic tasks like controlling smart home products, playing music and giving you information on the go. Sadly, it appears to be a China-exclusive for now, and that’s a great shame considering the sweet price of CNY199 (approx. Rs 1,900)! We’ll let you know as soon as it hits Xiaomi’s MiJia platform.